There’s No Place Like . . . Where? 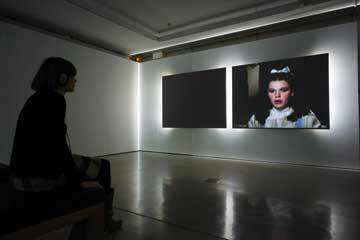 Has NMWA’s exhibition Total Art: Contemporary Video left you wanting to know even more about video artists? You’re in luck! Today, the museum opens a new installation, bringing even more video art into its galleries. After the Rainbow (2009), a video installation by Soda_Jerk, a two-person artistic collective from Australia, is presented in collaboration with the District of Columbia Commission on the Arts and Humanities’ public art project 5×5. For 5×5, five curators each invited five artists to install public art around D.C. Curator Justine Topfer coordinated with NMWA to present this work, in which Soda_Jerk explores themes such as the passage of time, age, stardom, and melancholy. After the Rainbow plays on our culture’s collective interest in both the characters portrayed by film stars in movies, and the turbulent mythologies of their private lives. In what the artistic duo calls “séance fiction,” they present clips of Judy Garland as Dorothy in The Wizard of Oz, reimagined. 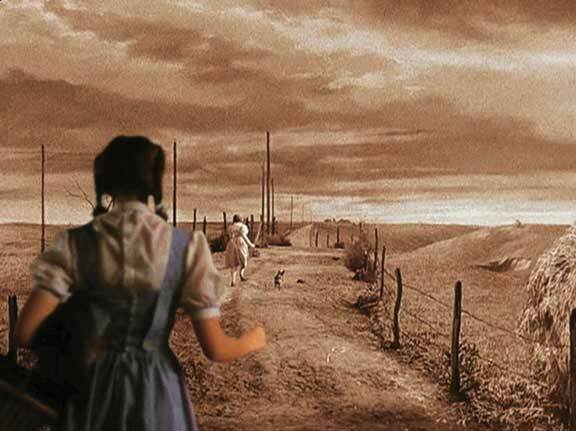 Instead of being swept by a tornado to the bright and colorful Oz, Dorothy instead comes face to face with her future self. Created using a process called sampling, Soda_Jerk splices together segments from film and television, creating a sort of moving collage. Viewers see the young Garland in the role that cemented her stardom, alongside her older, jaded self, as she appeared in a 1960s television special. This video installation is the second in their series “Dark Matter”; each video juxtaposes youthful old-Hollywood icons encountering their spectral future selves. As viewers see Dorothy and the adult Garland side by side, the video emphasizes the unexpected turns a life can take—in this case between her tragic later life in Hollywood and her youthful exuberance and promise—as well as the factors that can make a narrative more complex than it seems. After the Rainbow will be on view September 19–October 2. This entry was posted in Artist Spotlight, News and Updates, NMWA Exhibitions, Public Programs by Women in the arts. Bookmark the permalink.